We are trying another experiment – polling SNU members on-line. This is part of our ongoing efforts to provide an opportunity for more of our members to be involved in the activities and decisions of the SNU. For this experiment we have two questions for which we would like your input. One is on dues payments and the other on an annual rally fee. We have some other projects in the works so your input would be very helpful in making a decision on these two questions and also on the use of on-line polling. Check what’s new on SNUZE for links to the Davis Creek rally photo gallery, and photo galleries of the new Quicksilver Airstream and additions to the show_n_tell page. Wes and RoyLaine 1984 31 ft Airstream Excella photo gallery. Donald Sensing reviews the current state of the art in The self driving car, on the way. Mercedes Benz’s 2006 S Series sedan, their top of the line model on the US market now, has radar-directed self acceleration and self braking coupled with the cruise control. Once you set the cruise, the Benz will brake, including emergency braking to full stop if necessary, and will auto-resume the set speed, even from a stop. Now Honda has developed a self-steering car that will hit overseas showrooms next year. It also has automatic cruise control. Can you imaging calling your car on the cellphone to have it come pick you up? With the GPS on modern cell phones and mapping software, your car could know just where to go and how to get there. The SNU rally at Davis Creek photo gallery is now up. 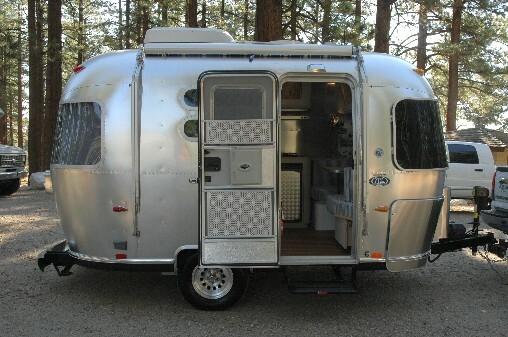 Jon brought a brand new 2006 Bambi Quicksilver edition Airstream out to Davis Creek for the SNU folks to inspect. Cute little thing. Interesting to contrast with Gene’s t@b, too. Do you have a genset (generator and motor set) in your RV? Many motorhomes have a genset built into a compartment that taps the vehicle fuel supply. These are usually wired into the RV and have a transfer switch to control whether the genset or park power is feeding the RV. Trailersists often use a portable genset with its own gas tank and plugs so they can plug the trailer into either park power or the genset. These gensets often have a grounding terminal. That causes some to ask what should be connected to that terminal. The signal light people have a good answer in the article Generator Grounding. When are Ground Rods Required at Portable Generators? It describes what the codes call a “separately derived system” and why earth grounding is used. Where required for a generator, the purpose of the ground rod(s) at a generator is to limit the voltage from surges, lightning or unintentional contact with high voltage lines, and to limit the voltage to ground on conductive metal parts. What is all comes down to is that most RV genset use is when the RV has no connection to park service or the electrical grid. As long as the genset frame and RV frame are electrically connected, which they usually are through the plug ground, then you don’t need to worry about grounding to earth. Digital camera reviews has an interesting article on a fluid lens. Named Fluidlens, this lens is made of liquid and is no bigger than a contact lens, but can achieve an optical zoom of up to 10 times, matching the zoom capabilities of lenses found on mid-range and high-end digital cameras and superior than most cellphone cameras which use digital zoom that relies on software rather than the lens to zoom in on an object. This liquid lens system achieves optical zooming through altering its focal length by changing its shape which mimics the action of the human eye. The 2005 fuel economy ratings report (PDF File) not only tells you about the government fuel ratings but also has other good information for better fuel efficiency. Another source of reading material is the Christian Classics Ethereal Library. Classic Christian books in electronic format, selected for your edification. There is enough good reading material here to last you a lifetime, if you give each work the time it deserves! All of the books on this server are believed to be in the public domain in the United States unless otherwise specified. Copy them freely for any purpose. Outside of the US, check your local copyright laws. If you are looking for cell phone towers, try mobile media. The Paint and Coatings Industry site has an introduction to IR-reflective pigments. While the human eye is sensitive to only a small part of the electromagnetic spectrum, pigment interactions with wavelengths outside the visible can have interesting effects on coating properties. One key area of the spectrum is the infrared (IR), specifically the near infrared. While not visible to the human eye, a pigment’s, and thus a coating’s IR properties can affect usability and durability. The primary purpose of IR-reflective coatings is to keep objects cooler than they would be using standard pigments. This IR-reflective feature is the basis for their use in markets like Cool Roofing for the EPA’s Energy Star Program1 and the California Energy Commission2 Title 24 2008 version. This technology is also finding use in transportation and other areas where the ability to stay cool is a valuable benefit. The Christian Science Monitor carried a story: National parks grapple with surge of illegal off-road vehicles. This one is likely to mean more rules and regulations to deal with. The recent hurricanes have given a lot of people a chance to hone and refine their emergency preparedness kits (EPK). Owen’s lists are good to review to compare with your own. The big idea, though, is that there isn’t just one list. Different emergencies and different scenarioes have different needs. The three categories Owen suggests make for a good start in being prepared for near anything. Your Bug Out EPK should be ready to go at short notice. The Get Home EPK is good for planning on the trek back to sanity. The Hunker Down EPK is for when you see that it is going to take a while. check out A Short Course on Automatic Transmissions by Charles Ofria. The modern automatic transmission is by far, the most complicated mechanical component in today’s automobile. Automatic transmissions contain mechanical systems, hydraulic systems, electrical systems and computer controls, all working together in perfect harmony which goes virtually unnoticed until there is a problem. This article will help you understand the concepts behind what goes on inside these technological marvels and what goes into repairing them when they fail. Did you know that there was a lot of footage shot in color during World War II? See the web site to find out more. Driving under the influence of Web maps ny Elinor Mills (Staff Writer, CNET News.com) describes the results of requesting various online mapping sites for directions between two points in San Francisco. Yahoo, MSN, Google, Mapquest – they don’t all come up with the same answers as to the best route. These mapping services can also provide other solutions. Wired has an article about Better Directions: Digital maps are changing how we navigate our lives. All the overlords of Internet search – Google, MSN, Yahoo!, even Amazon’s A9.com – provide cartographic results embedded with information. Augmented reality is the latest benchmark of the digital age. On the other hand, the most powerful maps can actually make it easier to get lost. Dazzled by their features – immersed in topographic information and GPS coordinates – we forget just to look around. In his book Between Meals: An Appetite for Paris, A. J. Liebling blamed a decline in French cuisine, starting in the 1920s, on the Michelin Guide. And then there are the in-car navigation systems. When you have a mapping program in your vehicle coupled to a mobile internet connection you can end up with a tourguide. Right now, its telling you about nearby attractions. Pretty soon, you might be able to have your car narrate stories about local geology or meteorology or history or whatever that is pertinent to your location and direction of travel. 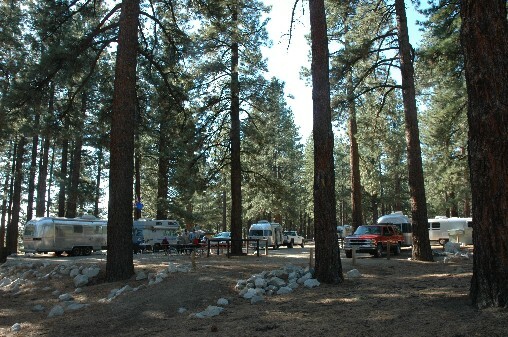 Monte Verde RV Park and Campground has a page with tips for staying at the park in winter. The ideas and tips are useful but the snowfall is distracting and can slow down your computer. Glue it, but which glue? This to that has a form where you can choose what two kinds of things you want to glue together. It will then suggest the best glue for the job. Check out the ‘trivia‘ and ‘FAQ‘ sections, too! Remember that old story about the guy who got a new motorhome and sued the manufacturer after his first trip? See, he had set the cruise control and then got out of his seat to go to the bathroom. He was irate that the new motorhome crashed. DARPA (defense research agency) has had a contest to see if anyone could make a driverless vehicle traverse a course with steep drop-offs, obstacles and tunnels over a rugged 132-mile course without a single human command. This year, despite modeling the course on Afghan conditions, there were four successful entries. Maybe one day you will be able to program your RV and leave the driving to your robot. Glen Reynolds discusses this advance in technology as a part of a broader picture at Tech Central Station. He cites the Washington Post story about how Stanley the VW Touareg, designed by Stanford University, zipped through the 132-mile Mojave Desert course in six hours and 53 minutes Saturday, using only its computer brain and sensors to navigate rough and twisting desert and mountain trails. Also see Popular Mechanics. One thing these smarts will do is to reduce accidents. The Nevada Traffic Crashes reports indicate that most crashes are caused by people who can’t stay in their lane, don’t pay attention to their driving, or get distracted. Robots don’t tend to exhibit these problems. But remember that story (true or not I don’t know) about how Greyhound installed radars on the front of their buses in order to make sure they kept a proper open distance in front. But some of the cars that passed the buses had radar detectors that went off as soon as they got in front of the bus. Since they thought a cop had them in a speed trap, the cars then put on the brakes right in front of the bus. The moral of the story is that we have to be careful of unintended consequences when any new technology is implemented. Drive safe. Pay attention to what you are doing! Do you use these things? They can be helpful in keeping water use down as well as convenient. If you wonder about the history or range of users, see the Moist Towelette Online Museum. A new photo gallery of Sage Hen Summit on US 395 down towards Lee Vining has been posted. The SNU just received notice from our Region 12 President, Jim Emlinger that a regional newsletter is now posted. It has been a while since there has been a regional newsletter and this looks like a great start. The new Region 12 board seems to have a lot of ideas and enthusiasm. One issue they are focusing on is enhancing the communications between the Units and the region. The SNU looks forward to hearing more from our regional representatives and supports their efforts.